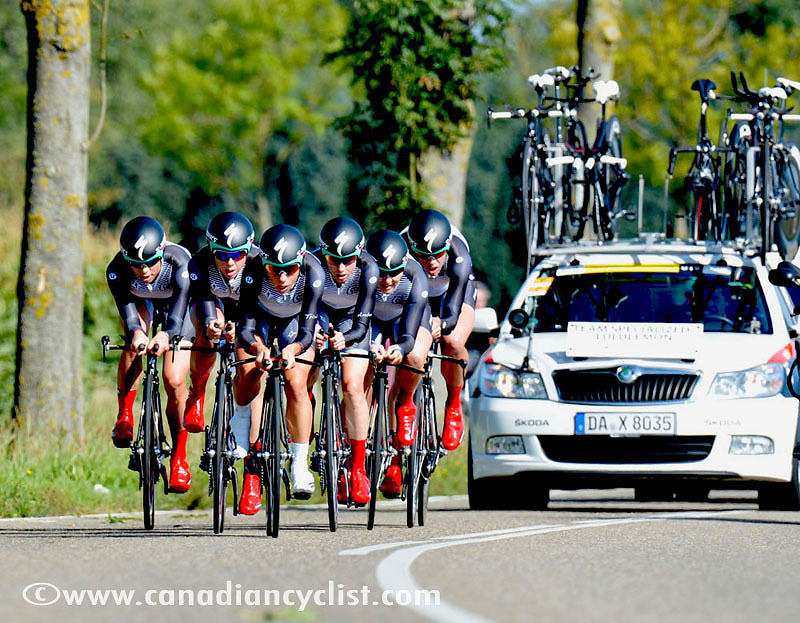 The 2012 Road World Championships opened on Sunday in the Limburg region of the Netherlands with a new event - the Team Time Trial for women's and men's trade teams. This is the sixth time that the Worlds have been held in Limburg - 1938, 1948, 1967, 1979 and 1998. 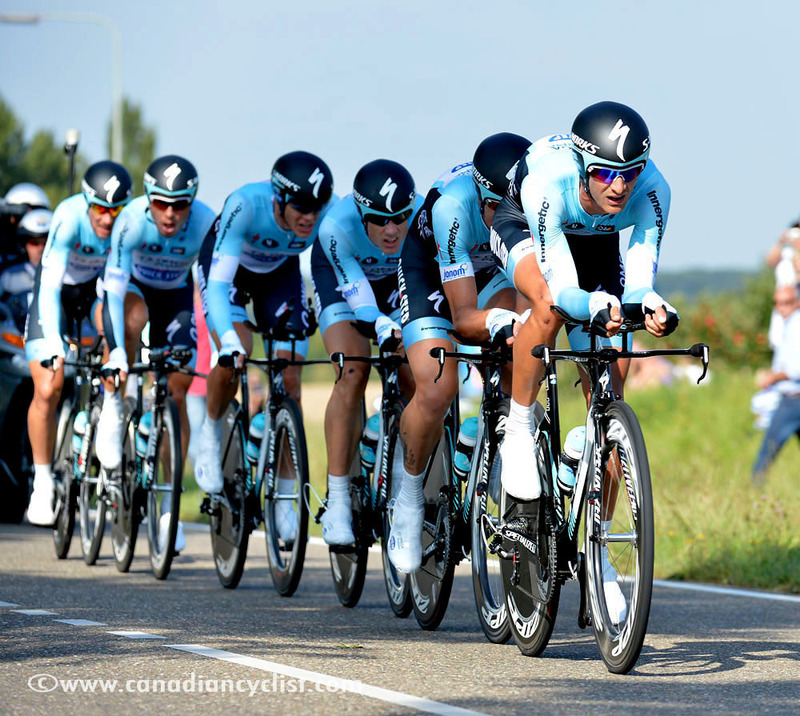 Twelve women's squads and 32 men's participated in this new competition, with Specialized-lululemon winning the women's title and Omega Pharma - QuickStep the men's. Canada's Svein Tuft was on the bronze medal winning men's squad, Orica-GreenEDGE (Note: We have an interview with Svein at the bottom of this article. The course could best be described as technical ... very, very technical. Running mostly through an urban setting, it took the teams of six (time taken on the fourth finisher) down narrow streets, around at least a dozen roundabouts and into sharp corners, before finishing with a climb to the top of the famous Cauberg climb in Valkenburg. This climb will be the finish for every race - time trial and road race - but each day will see the start in a different city of the region. Specialized-lululemon was the favourite for the women's race, and they led through every time check, beating Orica-AIS by 24.19 seconds, with the Dutch squad AA Drink taking bronze, just ahead of Marianne Vos' Rabobank team. Rabobank had a rider suffer mechanical problems early in the race, and had to ride most of the 34 kilometres with the minimum four riders. The men's race was expected to be between Omega Pharma, Orica-GreenEDGE, BMC and Rabobank, and that is how it developed. Rabobank went out very aggressively, and was tied with Omega Pharma at the first split, sliding to third at the second, and then blowing up on the Cauberg to finish fifth. Liquigas-Cannondale rode a better paced race to finish just ahead of them, in fourth. BMC, the third from last team to start, steadily increased their pace through the 53.2 kilometre course, led by Tejay van Garderen and Philippe Gilbert. They came within 3.23 seconds of Omega Pharma at the finish. Orica-GreenEDGE started faster, then faded a bit in the middle before recovering to retake third from Rabobank. "I put this victory near my biggest, along with the Classics and the Road World Championship," Tom Boonen said. "I didn't expect to win a race like this, first of all because it never existed before and in the past it wasn't our discipline. We worked a lot and now we are there. It's a team victory even for the staff. It's really a change of mentality going on."